Fort Grey is a Martello Tower overlooking the magical west coast bays of Guernsey. Known locally as 'the Cup and Saucer', it was built in 1804 as part of the island defences against the French. The tower now houses a Shipwreck Museum. The Fort was restored and converted into a Shipwreck museum in 1976. 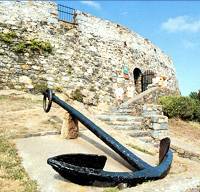 This houses a collection of maritime artefacts and information relating to ships and shipwrecks around the treacherous west coast of Guernsey. From HMS Sprightly, wrecked on Hanois Reef in 1977 to the sad story of MV Prosperity which sank in January 1974 with 16 drowned, the display serves as a poignant reminder of the perils of the sea. On Wednesday mornings at 11.15 am (May - September) members of Guernsey Museums & Galleries 'History in Action' Company enact stories from the Island's past.